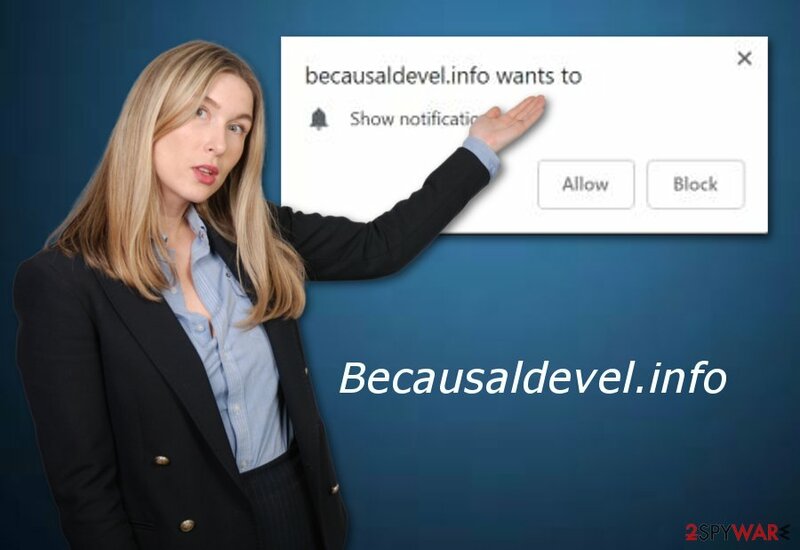 Becausaldevel.info is adware which collects browsing-related information and provides annoying advertisements. Becausaldevel.info is an application which seems to carry out extremely annoying activities once installed onto a PC. This unwanted activity is caused by the main adware program that focuses on creating commercial content. What it does is delivering irritative advertisements and taking the user to unrecognizable websites. Adverts can appear in various forms (pop-ups, pop-unders) whenever you decide to use the web browser such as Chrome, Firefox, Edge, or Explorer. Furthermore, hb6z.becausaldevel.info pop-up ads might appear on your desktop and interrupt your daily PC's usage. If you noticed these ads asking you to click the “Allow” button, you are dealing with one of two scenarios: you either entered a rogue site or recently downloaded a program bundled with an adware-type virus. Note that adware is created to modify the browser's homepage, display annoying ads, redirect users to developer-sponsored sites, and even collect non-personal information. Google Chrome, Microsoft Edge, Mozilla Firefox, etc. If you are being redirected by Becausaldevel.info virus, you might accidentally land on a potentially harmful website. This way a dangerous computer virus might infiltrate the system and cause lots of damage. As we can see, the Becausaldevel.info adware is not dangerous itself but it can definitely take us to potentially harmful webpages filled with virus-related content. If you step on a corrupted link, you might secretly install malware such as ransomware or a Trojan horse into your PC. You might have heard about a marketing technique called “cost-per-click”. Well, this method is commonly used thru adware developers as it lets them gain benefit from their advertising posts. Be careful with such ads as they might promote a totally useless product and put lots of effort to convince the user to buy it. In order not to get tricked, take care of the Becausaldevel.info removal as soon as you overcome the PUP in your computer system. Potentially unwanted programs such as Becausaldevel.info are distributed widely throughout the Internet for beneficial reasons. Talking about adware, these PUPs bring income to their developers by using strategic marketing techniques. Adware programs might signal about themselves in more than one way. Actually, these potentially unwanted programs are not that hard to identify. If you see strange browser modifications that you do not remember performing, if you are receiving an increased amount of ads, or experiencing questionable redirects, an ad-supported program such as Becausaldevel.info virus is definitely the guilty one for this type of activity. Make sure you do not hesitate and remove Becausaldevel.info from the system and clean the infected browsers from unneeded add-ons and extensions. There is no need of keeping this rogue application on your PC as all it does is enhance your browsing history, promote annoying adverts, and redirect you to unknown pages. 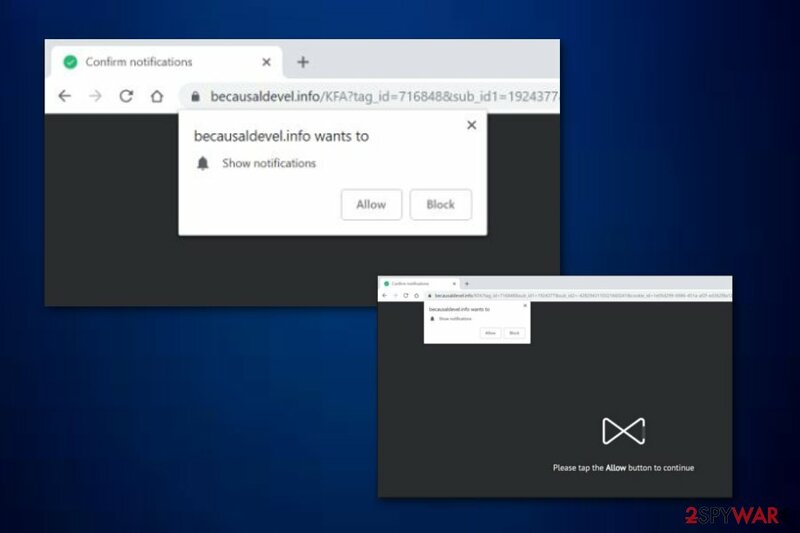 Always remember that Becausaldevel.info push notification virus or other adware-type programs can change preferences of your browser, add extensions, bookmarks or tools. Also, the program allows desktop and in-browser notifications so you need to change all those settings, delete unwanted content. Additionally, Virusai.lt team offers using anti-malware tools which are software created to detect system issues and the ones who are guilty for the caused trouble (i.e. rogue adware-related components). You can use a tool such as Reimage. 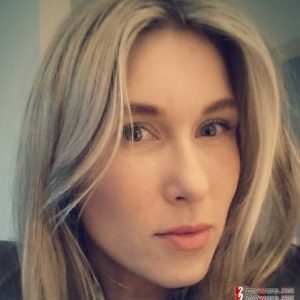 Becausaldevel.info - a potentially unwanted program which enters the computer thru a rogue site or via bundling. Adware applications and their components can be injected in specific hyperlinks which we can find on a questionable page on the Internet. Be aware of all websites that look suspicious to you. If you ever enter one – make sure that you eliminate it immediately and never return. However, adware is not the worst infection that can appear in the system. You can also experience secret malware infiltration if you carelessly click on everything you see on the Web. Furthermore, ad-supported programs can be spread with the help of bundling. These PUPs come together with regular programs and infiltrate the system during the installation process. Gladly, if you choose the Custom or Advanced installation mode over the Quick/Recommended one, there is a big chance that you will avoid adware programs in the future. Here you will also be able to opt-out all software you do not want to download to your computer. Additionally, a good option is to purchase a reputable and strong antivirus program. Anti-malware software is specially created to protect computer system manually from possible damage or infections that might occur thru time. However, you will need to take care of your tool properly – always performed advisable updates, otherwise, it might complete operation not that effectively as before. If you want to stop the annoying advertising and bring your web browsers back to their starter positions, you need to remove Becausaldevel.info from your computer and web browsers including Google Chrome, Mozilla Firefox, Microsoft Edge, Internet Explorer, or Edge. Otherwise, the annoying activity will only increase and intrude your browsing work. Open your browsers and get rid of extensions that were added during the adware infection period. Got to browser Advanced Settings. Find Content settings and Notifications section. 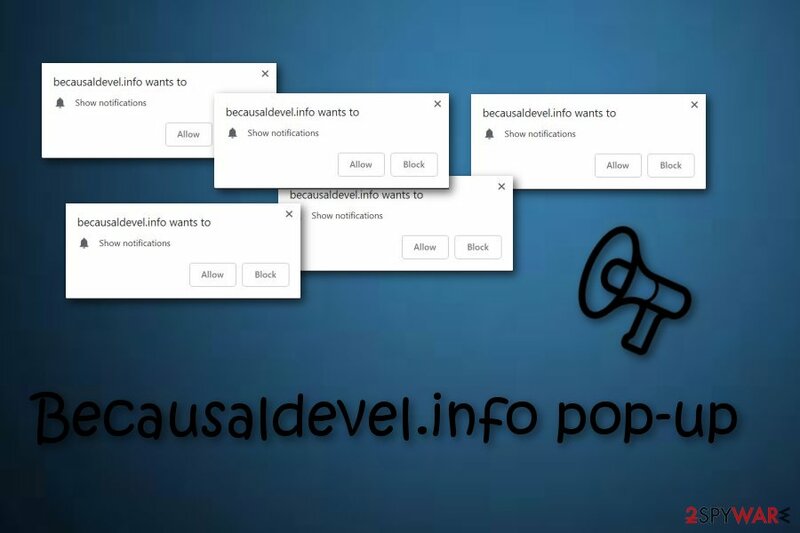 Check for Becausaldevel.info or other sites that cause pop-ups and different issues. Then, press the right button of your mouse on each of them and choose Remove. Continuously, you can perform the Becausaldevel.info removal by using reputable antivirus tools or our below-provided manual elimination guide. Make sure that your web browsers are refreshed and all adware components have been deleted successfully. Moreover, do not forget to put some effort and protect your computer system from ad-supported applications in the future, memorize all PUP prevention tips and you might see in the future how useful they turn out to be. Here, look for Becausaldevel.info or any other recently installed suspicious programs. When in the new window, check Delete personal settings and select Reset again to complete Becausaldevel.info removal. Once these steps are finished, Becausaldevel.info should be removed from your Microsoft Edge browser. Here, select Becausaldevel.info and other questionable plugins. Click Remove to delete these entries. Now you will see Reset Firefox to its default state message with Reset Firefox button. Click this button for several times and complete Becausaldevel.info removal. Here, select Becausaldevel.info and other malicious plugins and select trash icon to delete these entries. Click Reset to confirm this action and complete Becausaldevel.info removal. Here, select Extensions and look for Becausaldevel.info or other suspicious entries. Click on the Uninstall button to get rid each of them. Now you will see a detailed dialog window filled with reset options. All of those options are usually checked, but you can specify which of them you want to reset. Click the Reset button to complete Becausaldevel.info removal process. ^ Larry Kim. Cost Per Click (CPC): Learn What Cost Per Click Means for PPC. Word Stream. Advertising techniques explained. ^ Adware. Techopedia. Tech-related definitions and compute information. ^ Scott Orgera. What are Browser Favorites?. Lifewire.com. News site. ^ Virusai.lt. Virusai. Cybersecurity news website. ^ Hyperlink. Computer hope. Free computer help since 1998. This entry was posted on 2019-02-28 at 08:04 and is filed under Adware, Viruses. You can quickly scan the QR code with your mobile device and have Becausaldevel.info manual removal instructions right in your pocket. How did you remove Becausaldevel.info?